1.1 The Website is provided to you for your personal use subject to these Terms and Conditions. By using the Website you agree to be bound by these Terms and Conditions. 2.1 We may update these Terms and Conditions from time to time for legal or regulatory reasons or to allow the proper operation of the Website. Any changes will be notified to you via any e-mail address provided by you or via a suitable announcement on the Website. The changes will apply to the use of the Website after we have given notice. If you do not wish to accept the new Terms and Conditions you should not continue to use the Website. If you continue to use the Website after the date on which the change comes into effect, your use of the Website indicates your agreement to be bound by the new Terms and Conditions. 3.1 The content of the Website is protected by copyright, trade marks, database right and other intellectual property rights. You may retrieve and display the content of the Website on a computer screen, store such content in electronic form on disk (but not any server or other storage device connected to a network) or print one copy of such content for your own personal, non-commercial use, provided you keep intact all and any copyright and proprietary notices. You may not otherwise reproduce, modify, copy or distribute or use for commercial purposes any of the materials or content on the Website without written permission from the Company. 4.2 You will be responsible for our losses and costs resulting from your breach of this clause 4. 5.1 Although we aim to offer you the best service possible, we make no promise that the services at the Website will meet your requirements. We cannot guarantee that the services will be fault-free. If a fault occurs with the Website you should report it to info@hear4you.com and we will attempt to correct the fault as soon as we reasonably can. 5.2 Your access to the Website may be occasionally restricted to allow for repairs, maintenance or the introduction of new facilities or services. We will attempt to restore the service as soon as we reasonably can. 6.1 The Website may on occasion provide content from other Internet sites or resources and while the Company tries to ensure that material included on the Website is correct, reputable and of high quality, it does not make any warranties or guarantees in relation to that content. If the Company is informed of any inaccuracies in the material on the Website we will attempt to correct the inaccuracies as soon as we reasonably can. 6.2 If we are in breach of these Terms & Conditions, we will only be responsible for any losses that you suffer as a result to the extent that they are a foreseeable consequence to both of us at the time you use the Website. Our liability shall not in any event include business losses such as lost data, lost profits or business interruption. 6.3 This clause 6 shall not limit or affect our liability resulting from any products sold through the Website being found to be unsafe or if something we do negligently causes death or personal injury. 7.1 As a convenience to customers, the Website on occasion may include links to other web sites or material which are beyond its control. The Company is not responsible for content on any site outside the Website. 8.1 Part of the Website may contain advertising and sponsorship. Advertisers and sponsors are responsible for ensuring that material submitted for inclusion on the Website complies with relevant laws and codes. We will not be responsible to you for any error or inaccuracy in advertising and sponsorship material. 9.1 These Terms and Conditions will be subject to the laws of England and Wales. We will try to solve any disagreements quickly and efficiently. If you are not happy with the way we deal with any disagreement and you want to take court proceedings, you must do so within the United Kingdom. 10.1 We make no promise that materials on the Website are appropriate or available for use in locations outside the United Kingdom, and accessing the Website from territories where its contents are illegal or unlawful is prohibited. If you choose to access this site from locations outside the United Kingdom, you do so on your own initiative and are responsible for compliance with local laws. 11.3 The Company shall not be responsible for any breach of these Terms and Conditions caused by circumstances beyond its reasonable control. 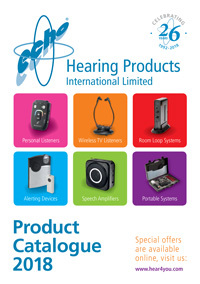 11.4 The Website is owned and operated by Hearing Products International Limited, registered in England and Wales under company registration number 02531653 whose registered office is at Echo House, 26 Haigh Park, Haigh Avenue, Stockport, SK4 1QR and whose VAT number is GB 606 4762 40.